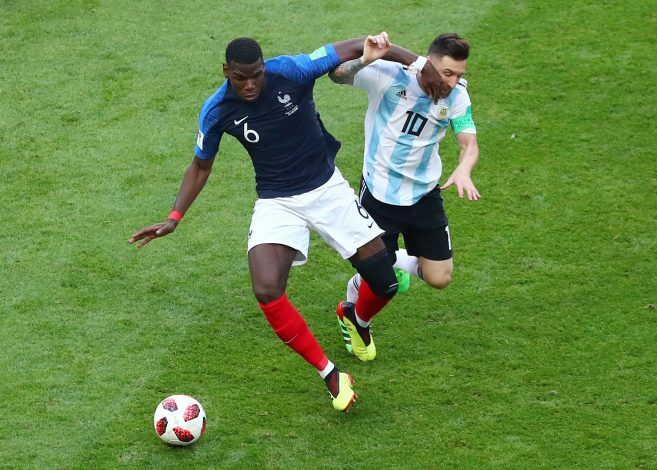 Argentina bowed out of the ongoing FIFA World Cup 2018 after a cracking 7-goal encounter against France that saw the South American giants fall short. Lionel Messi was the main topic of discussion, as he saw his side part the coveted tournament. The Barcelona stalwart made his presence felt with two assists in the game despite failing to score in the knockout stages for the fourth World Cup in a row. Argentina lost the impetus in a tie dominated by 19-year-old Kylian Mbappe, who gave France a lifeline as Didier Deschamps’ side progressed to the quarters. For France, Paul Pogba had a commanding say in midfield alongside the experienced N’Golo Kante and Blaise Matuidi. Deschamps benefitted in his tactical masterclass, and it was Pogba who attracted attention post the win as well. The United player paid a fitting tribute to Messi after France’s 4-3 victory on the night. As per GIVEMESPORT, when the 25-year-old was asked to talk about Messi, his response on the Argentine was a class act. He acknowledged that France played against the best player, besides saying that because of Messi, he fell in love with football. “We (France) have played against the best player in the world (Messi). I’ve been watching him for ten years to learn from him. He makes me love football. He’s always going to be an idol for me,” said Pogba. The round of 16 encounter saw Angel di Maria and Benjamin Pavard scored absolute stunners, with Mbappe stealing the show after contributing with a brace besides playing a part in the opening goal as well. France play Uruguay in the last eight, with the latter seeing off Portugal 2-1.